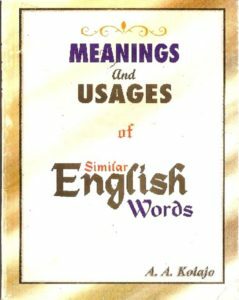 Meanings and Usages of Similar English Words discusses similarly pronounced English words. It explains some confusing words with similar spellings but different meanings. The book does not merely give the meanings of the words concerned, but helps understand how each word is used in a sentence or sentences. The book, though not exhaustive of the list of words and expressions that can enter into this category of the subject, will no doubt be useful to lawyers, judges, journalists, students of English and all other users of the English Language.